What a year of fishing we had in 2017! Today is the first day of 2018 and we are extremely excited to get things underway including our prized sailfish season. I would like to thank all our wonderful customers for choosing us last year and making us one of the top sportfishing fleets in the country not just Florida. We have a lot of memories and look forward to creating new ones this year with new and repeat customers. This past week we had the University of Wisconsin football team come aboard before their big bowl game with the University of Miami. 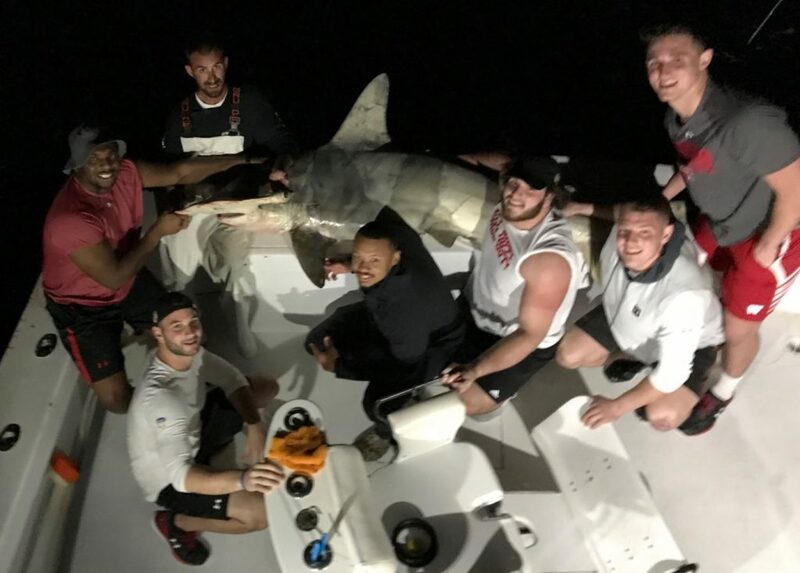 We knew these guys were strong so it was time to put them to the test and there is no better test than a 450 pound hammerhead shark! As we got setup, I could tell that by the conditions we were going to get our fish, it was just a matter of when. The current was streaming at about 2 knots which is very good for shark fishing. This helps us get the scent out as well as funnel fish into our spread. It wasn’t long before the clicker started to scream. The close group of teammates did an amazing job putting the heat on this beautiful fish. It was an up and down battle, but eventually we got the fish to the boat for a tag and release. Tagging sharks helps us to preserve not only the species, but all our oceans. Sharks play an important role to conservation. It was all high fives and smile as we quickly got the fish back into the water and saw her swim away healthy. The next time this fish is caught, the data will provide our research groups with information on migrations, size and a various other helpful behaviors of this great hammerhead shark. As we look forward, I expect the fishing to be nothing short of fantastic this week. We have north winds and another cold front that should push down even more fish into our area. Now is the time to get your trip in where you can expect a range of catches including mahi, kingfish, sharks, sailfish, wahoo and even a chance at a white marlin!